K100-forum.com » General discussion » Molys for 2019? With Honda moly gone the way of the Dodo, and Guard Dog now dog gone, is Staburags what most people using these days for spines? I need to do a lube soon, and I need to make an informed decision about what to get..(and right now I am not feeling very informed) . I have heard that Honda Moly 60 was replaced by a 77% moly version. It is available at Honda dealers. 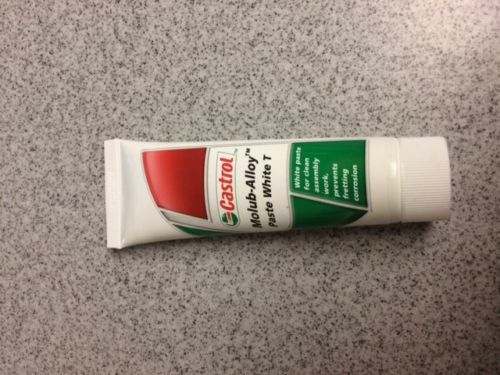 I have also seen a Loctite product which is a 77% Molybdenum assembly paste. Is it the same as the Honda stuff? Maybe. It's sold for industrial use, so I would think it's not a bad product. Castrol Optimol. Designed for high-pressure spline-like environments and sold by Motorworks. I got lazy a couple of years back and missed the annual spline lube. When I did finally get around to it another year later, there were still very visible traces on the bevel splines. Although the new Honda product has 77 in the name I'm not sure if that actually means it has 77% Moly. It's probably not a bad product though and the container is more practical for our use than a grease gun cartridge. There's a lot of moly lube products out there these days. I'd look for something that sticky (so it stays around) and also water resistant. This is super helpful. I don't typically trust reviews from online stores, and hearing what folks are actually using is what I trust. thank you. BMW have gone over from the white Optimol which I used for 160,000 K's to a silver Optimol Molub Alloy Paste TA BMW part No 18 21 9 062 599 cost $30.90 a tube that I have just started using. I ordered a new spline from the UK and visibly it looks the same as the splines on my OE shaft. After ordering the splines I managed to score a brand new shaft which has larger flats on the peaks. Looks like I'll be getting the Molykote from bob's (although I'm kind of feeling like I would like the Castrol. the Optimal doesn't seem to be available in the states. At least I have a direction now. The above is a link to 5150 Motorsports, who are just one of the many suppliers selling this silver version in the US. I mix this 50/50 with the new Honda moly lube. VK I got mine off our local BMW dealer the part # 18 21 9 062 599. It did however take a few back and forth phone calls and a bit of persuasion to get them to part with it. They posted it out for $5.00AU for standard delivery or I could have got it overnight for $10.00 Au. I was going to give the Millers Delta 2ep grease a go. Its available from Motorworks in the uk, not sure if you will get it in the states. Looks a bit job to do both splines. Was looking at the Chris Harris video on the you tube. That is a funny and informative man. As for Chris' videos... yah he is funny, intense and he really knows K's. When I watch the videos, I kind of feel he is talking to me personally. I can only take it in small doses though.